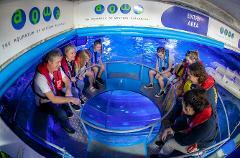 **For ages 4+ years** Glide across the top of the 3 million litre tank in our Glass Bottom Boat! This bespoke experience gives you a birds eye view of the marine life while the large rays, sharks and turtles swim beneath your feet! Plunge into the beautiful world of AQWA’s shipwreck coast aquarium and come face to fin with sharks, stingrays and hundreds of stunning fish. Keen snorkellers aged 15+ can participate, maximum 3 people in this Adventure. Plunge into the beautiful world of AQWA’s shipwreck coast aquarium and come face to fin with sharks, stingrays and hundreds of stunning fish. 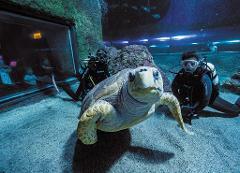 Qualified divers aged 15+ can participate in this Adventure. Maximum 4 people. 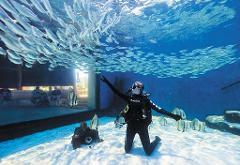 Enjoy this interactive diving adventure lead by one of AQWA’s Dive Instructors in our Adventure Bay aquarium!